In the glory days of Formula One, constructors and designers weren’t limited by a strict set of rules and safety regulations as they are today. The brave and forward-thinking engineers followed their ideas freely and have revolutionized the sport in the process. However, they sometimes produced strange creations which left their mark in history, not by the success on the track but by their eccentric appearances and different approach. The 1976/1977 Tyrrell P34 Formula One was one such car, and it did not have a very successful role to play in the vivid history of Formula One. The Tyrell P34 (Project 34) car was conceived by Derek Gardner, a well-known Formula One designer who worked for the Tyrrell racing team. Gardner’s first job in Formula One was designing the four-wheel drive systems for Matra MS84 racing car in 1969. He joined Ken Tyrrell in 1970. In 1971, Jackie Stewart took the world championship title with his car and Tyrrel took the constructors’ title. Just as any other F1 constructor, Gardner always wanted to come up with ways of making his car have more grip, a more precise handling and steering and a better way to put the power to the ground. By exploiting the loopholes in regulations, Gardner started developing the new six-wheel concept in 1973. The whole idea behind a radical six-wheel layout was that six tires instead of four would have a bigger rubber ‘finger print’ than the regular cars, more grip and no understeer. The four wheels with smaller diameter tires in the front would manage better steering and would also have a lower profile for better aerodynamics. The car used four specially manufactured 10-inch-diameter (254 mm) wheels and tires at the front, with two ordinary-sized at the back. The six-wheel design reduced the drag which would have been caused by two larger front wheels, increased the total contact patch of the front tires and created a greater swept area for the brake discs. In theory, everything should have worked perfectly and the new car should have been an immediate success. While the Tyrrell P34 is the most widely known six-wheeled F1 car, it was not the only one. March Engineering, Williams, and Scuderia Ferrari teams also built experimental six-wheeled F1 chassis, but all of these had four wheels at the back rather than at the front like the P34. The Williams FW07D and FW08B, and the March 2-4-0 had tandem rear wheels, which reduced drag by using the smaller front wheels and tires in place of the typical larger rear wheels. The Ferrari 312T6 featured four rear wheels on a single axle. This was similar to how Auto Union increased traction with its Type-D Grand Prix cars in the 1930s. Despite extensive testing, neither the March, Williams, nor the Ferrari were ever raced. In 1983, the FIA prohibited cars with four driven wheels from competing. Later, the Formula 1 regulations required four as the maximum number of wheels allowed. The Cosworth-powered Tyrrell P34 was first introduced and raced in early 1976 and immediately became the star of Formula One. Till that point, no one had ever seen a six-wheeled racecar before and the crowd was thrilled at this novelty. Tyrrell team and its sponsors really loved the attention they were getting and P34 was soon all over the front pages of magazines across the world. However, despite its potential, the car was somewhat difficult to drive. Firstly, it was heavier than a regular car as it had double the steering and double the front tires. Secondly, the handling was strange and drivers weren’t familiar with it. In some conditions, the understeer was present even with the four wheels in the front. The special Goodyear tires, developed especially for this car, just weren’t good enough. It first ran in the Spanish Grand Prix, the fourth event of the season 1976, and proved to be very competitive. Both Jody Scheckter and Patrick Depailler, the Tyrrell Racing team drivers at that moment, showed that they were able to produce solid results. Depailler qualified third behind James Hunt and Niki Lauda. After a slow start, Depailler was running fourth when he spun off in Lap 25 and crashed with brake problems. Scheckter started 14th on the grid and retired after 53 laps because of engine problems. Next was the Belgian Grand Prix; Scheckter finished fourth, while Depailler retired when his engine blew up. At the streets of Monte-Carlo, Tyrrell scored double podium, with Jody and Patrick behind the winner Niki Lauda. After Monaco’s podium, the first and only win came at the Swedish Grand Prix at the Scandinavian Raceway in Anderstorp. Scheckter and Depailler finished first and second, and till date, Scheckter is the only driver ever to win in a six-wheeled car. Jody Scheckter took the pole, with Depailler qualified in fourth. It was Mario Andretti in the Lotus 77 who led for the bigger part of the race. He had been penalized sixty seconds for jumping start, so he wanted to build a big lead ahead of the two Tyrrells. In lap 46, the engine failed and Andretti retired, so Scheckter and Depailler had a clear way to the victory. They went on to finish first and second with a 19.7s gap while Niki Lauda finished third. The 1976 French Grand Prix at the Circuit Paul Ricard was also successful, with Depailler finishing second and Scheckter sixth. At Brands Hatch, the South African took the podium, while Depailler retired with engine problems. Scheckter crossed the finish line behind Hunt and Lauda, but Hunt was disqualified so Scheckter was promoted to second. The next race at Nürburgring Nordschleife was marked by near fatal accident of Niki Lauda. James Hunt won ahead of Jody Scheckter who made the fastest lap time around the famous circuit. It was the last F1 visit to Nordschleife. Austrian Grand Prix, Dutch Grand Prix, and Italian Grand Prix followed without podiums, then in the last three races, Tyrrell P34 scored three podiums. Scheckter was second at Watkins Glen (US Grand Prix), Depailler was second at Mosport Park (Canadian GP) and Fuji Speedway (Japanese GP). Depailler added the fastest lap time to his podium finish at Mosport Park. At the end of the season, Jody Schecker finished third in the championship behind James Hunt and Niki Lauda. Scheckter scored victory in Sweden and four more podiums, while Depallier finished fourth in the standings with seven podiums. Elf Team Tyrrell finished third in the championship standings, behind Ferrari and McLaren. Interestingly, Patrick Depailler was always a big fan of the six wheel concept and Jody Scheckter was always very critical of it. Despite one victory and overall good result, he said that Tyrrel P34 was ‘a piece of junk!’. However, in 1977, he was replaced by Ronnie Peterson. During the 1977 season, the P34 was modified but the problems with tires and handling were still present. Depallier scored three podium finishes and finished 8th in the classification, while Peterson’s best result was third place at the Belgian Grand Prix and he finished 14th at the end of the season. Elf Team Tyrrell finished sixth. Season opening was bad with double retirements In Brasil and Argentina. At the 1977 South African Grand Prix at Kyalami, remembered by the horror accident in which the driver Tom Pryce and one marshal were killed, Depailler stole the third place from James Hunt in the closing laps. Peterson retired one more time. United States Grand Prix at Long Beach was also successful for Tyrrell’s leading driver, taking fourth place. Peterson retired fourth time in a row. During the 1977 season, Peterson recorded ten retirements in 17 races, while Depailler didn’t finish nine races. Peterson took his only podium at Belgian Grand Prix at Zolder, taking third place after Jody Scheckter retired in closing laps. The last memorable race for Peterson and Tyrrell P34 was the US Grand Prix at Watkins Glen. Although he finished just 16th, Peterson took the fastest lap prize. In the last race of the season at Fuji Speedway, Peterson participated in a spectacular crash with Gilles Villeneuve in which a marshal and a photographer were killed by debris. Patrick had a much better closure of the P34 story, with two podiums in last two races, at Mosport Park and Fuji. At the Canadian Grand Prix, Depailler survived dramatic last laps and finished second, behind the former team-mate Jody Scheckter who was driving for Wolf. 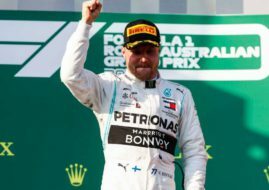 At the Japanese Grand Prix, Patrick caught the third place and added one more podium to the account of the unusual F1 car. Even though the car was still competitive, neither Ken Tyrell as team owner nor Derek Gardner as designer could figure out what direction to take in order to further develop this car. The weight problem was unsolvable, and widening the front track in order to gain more stability affected the aerodynamics. So, for the 1978 season, the P34 was abandoned and Tyrrell returned to more conventional race cars. The P34 was resigned to the history books and the cars were sold to private collectors as historic F1 oddities. All said and done, the Tyrrell P34 was, and still is, a crowd favorite and one of the most revolutionary race cars in Formula One. Occasionally, it is mentioned as an unsuccessful car with a strange layout but that is an incorrect representation of the car. It won one race and scored podium finishes, although it lacked the development and was ahead of its time. Who knows, maybe someday somebody reconsiders the six-wheel layout and takes this idea to its full capacity. We will just have to wait and see if that happens. Tyrrell P34 was one of the cars which appeared in the 2013 Hollywood blockbuster ‘Rush’, filmed by Ron Howard. The movie gave us a story about the famous Hunt – Lauda rivalry with the 1976 season in focus. P34 six-wheeler was one of the stars of the 1976 F1 season, so naturally it appeared in the movie. The cars used at the movie set were the 1976 Depailler’s chassis P34/2, which has been fully restored in the last few years, and the Martin Stretton’s 1977 chassis P34/6, dressed up in a 1976 body shell. There is an interesting story behind the P34/6, or chassis number 6. During the mid 1990’s, Derek Gardner teamed up with the historic F1 car owner Simon Bull in order to restore and enter a Tyrrell 005 (Jackie Stewart’s car during 1972 & 1973) in the inaugural FIA TGP Cup (Thoroughbred Grand Prix), which later became FIA Historic Formula One Championship. The car was driven by Martin Stretton and won its class. Spurred on by this success, Simon decided to resurrect one more late 70’s Tyrrell F1 car and asked Derek which car would be his choice. Derek naturally chose the P34. After some research trying to locate a car in good enough condition, the P34 chassis No 6 was purchased from a German car collector and delivered to the UK in late December 1997. This car had been a test car for Ronnie Peterson and Depailler during the 1977 season. The main problem with resurrecting the car was the front tires, but when Derek and Simon approached Avon, who made the tires ran by all the TGP cars, it was found that not only did they have access to the original tire molds, but also two of the Avon engineers had worked on the Goodyear 10″ tire project back in the late seventies. Avon agreed to have a go and Project 34 was back in business. Tyrrell P34 was restored in the following year and was ready for its first track shakedown at Donington Park in March 1999. The car suffered a few teething problems which weren’t serious, and after a few more outings, it was ready to contest the 1999 championship. The car proved to be extremely competitive, always qualifying on the first and second rows and when it finished, it was in the points. When the car was run at Monza, Derek gave the team the same settings he had given the Tyrrell team back in 1977 just before his departure from the team, and the car worked perfectly, proving once and for all that his concept was not flawed, and that given good rubber, it could have been a true F1 legend. Martin Stretton and the resurrected P34 had a great year in 1999, and the team won the championship title in 2000. In the following years, the car has participated at the Goodwood Festival of Speed and made regular appearances at many historic events, attracting crowds and the press wherever it appeared.